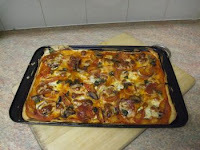 Kate The Bake: Shock and awe, the making of a gluten free pizza! Oh my, what have I let myself in for? It took ages for me to pluck up courage to start writing a blog. I read endlessly around different genres, thought deeply about how portray myself, how to find my true voice (without swearing, that is!). But I have just discovered that I didn't actually think about the process of documenting my cooking processes and how that would work. And that is where the awe kicks in. I have just had the briefest glimpse of how difficult this process is. I am blown away by all the bloggers out there who put themselves through this experience on an almost daily basis, on top of their working and family lives, for my, and many others, entertainment. It is far more difficult than it looks to create a recipe from scratch (maybe this was my mistake, I am not inclined to follow recipes whilst I cook), to remember what ingredients you use (and when), and then take useable photos as you go along. It has just taken me 1 3/4 hours to get 2 pizzas on the table so another lesson learnt there - never, ever do this when you are hungry. I have just learnt that my stomach rules my style and the closer I got to getting the gf pizza into the oven, the less important style became. In reality that has also been by biggest mistake. I rushed greasing the tray for the gluten free dough / paste and it stuck. I baked at 235 deg C but it still stuck in the middle. I am going to give this recipe another go tomorrow, and I will see if i can cure it then. Otherwise it may be a case of reducing the amount of liquid. If you should try this and have any ideas, please let me know! My base owes much to every gluten free blogger I have ever read. 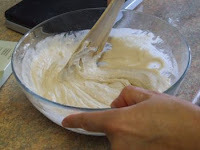 I have benefitted hugely from all their experiences and so when I came to make this, I was able to reach into the cupboard and guess at the ingredients. My baking cupboard is a tip.Ingredients are squeezed into every space on a double level cupboard, so the lazy person in me grabbed the 1st 3 gluten free flours I found. I think I could just have easily used sweet rice flour, gram flour (garbanzo bean flour), teff flour or a ready mix such as Doves Farm. As it was I found rice flour, sorghum and tapioca. In my professional life I don't use tapioca at all as I meet so many people who can't tolerate it. But I don't have a problem as long as I use it in moderation. Sorghum flour only reached my shelves a month ago. 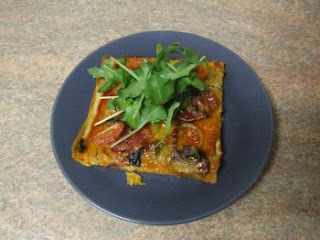 I have read often of glutenfreegirl's successes with sorghum but could never find a gluten free source in the UK. Having trailed round many ethnic shops in London, harangued all our work suppliers and still had no joy, a flash of inspiration came in the form of Taj Mahal in Hove. A desperate drive over for work testing rewarded me with the last 4kg on the shelves and fun in the kitchen. It hasn't proved to be the holy grail that I was hoping for, but to be honest, I know that I was being unrealistic to hope for everything in one grain. I don't eat sorghum often either but that is because I am unsure whether this particular brand is 100% pure. When we get some testing facilities in the bakery I will test a sample and then let you know. I hope it does turn out to be clean as it is a real bonus to the UK gluten free baker's repetoire. 5g (1 tsp) salt. I am sure you can use less, I just got carried away. Simply chuck everything in together and stir. It will be lumpy at first unless you have sieved all your flours (for yeasted doughs I don't often bother). *If you are using a retail brand baking powder you may find that it is activated by the warm water. The brand I use is commercial and it only reacts at temperatures of more than 45 deg C, I think most retail brands react at cooler temperatures. If you do find that your brand is triggered by cool water, you could put your yeast, sugar plus 50ml warm water (at blood temp - 38 deg C or slightly higher if you are in a rush) in a separate cup and stir until dissolved. 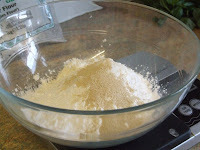 Mix the remaining 200ml water with the rest of your ingredients and add the yeast mixture once it has started to form a few bubbles. After a couple of minutes vigorous stirring, you will find your pizza base looks smooth and, well, paste-like. It won't look appetising but that doesn't metter yet. I don't recommend tasting it though, most gluten free doughs are not pleasant raw! Grease (really thoroughly) a baking tray approx 12" x 8" and spread the batter over the tray, right up to the edges.. Now sensible people will grease some film and lay this over the batter. However I got distracted by the phone at this point and forgot, I chucked the tray into the oven (as it had been used about 10 mins before) and chatted to my mum for ten minutes. When I got off the phone I discovered the batter had dried out and cracked a little but it had gained a little bit of spring (prod it and see what I mean) so I decided that was enough. I spread reduced sieved tomatoes over it as a base sauce then sprinkled a few slim slices of courgette, mushrom and red onion on top. 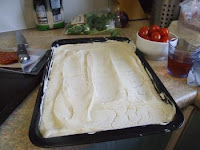 A short ration of peperoni slices (that is what happens if you attempt blog-cooking hungry!) 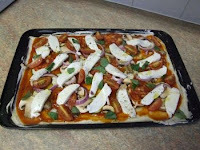 and fresh mozerella with a few basil leaves finished the pizza off and into the oven at 235 deg C for 20 mins. Please don't take my word for it on oven timings. I have been using my fan oven for several years, I know what works for me, where the hot spots are and how to rotate trays to get them evenly browned, I don't know your oven so I suggest you use an oven thermometer, check every 5 minutes, and probably rotate your tray each time too. I've already mentioned my pizza stuck to the tray, but hopefully that will be cured shortly! The thing is, it tasted great. Ultra thin, crispy you could taste each individual topping, which is just right by my standards. Just for the record I made some wheat bases for my daughter and friends too - whilst they enjoyed theirs, they decided the gluten free pizza was better - a definite 1-0 to us! i love thin crust pizza! have you thought of using parchment paper to solve your sticking problem...just a thought. looks amazing! Hi gfveg, Thank you for dropping by. I found a layer of baking parchment slowed the cooking of the base (I think it trapped air so reduced the contact with the tray). That meant I burnt the toppings too. 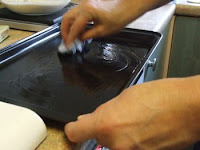 Greasing the tray as well as using baking parchment might work. I'll let you know. Bravo! Just jump in and keep going. I've been blogging a year and it's amazing how much I've learned in one year about gluten free baking and blogging. I don't bake very often, I don't like to measure. That fact makes it difficult to share my recipes sometimes. Keep having fun and keep cooking! That pizza looks delish!! Have you tried flouring the baking sheet before baking? I'm quite new to the blogging world as well and totally share your awe at the talent and dedication shown by the bloggers who make the own recipes from scratch - I wouldn't even know where to start!